Calling all furry farmers! Your dog can spend his outdoor time hanging out in The Barn. This is an outdoor dog “barn” with an indoor sleeping area and a porch where your dog can drink some lemonade and watch the cows come home. 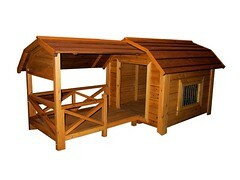 There is also The Stable, and if you dog doesn’t want to rough it, there is The Mansion. This entry was posted on Monday, May 21st, 2007 at 3:52 am	and is filed under Dogs, National Dog, Cat & Pet Info, Products & Services for Cats & Dogs. You can follow any responses to this entry through the RSS 2.0 feed. Both comments and pings are currently closed.